We all deserve a Little treat, and our dogs are no exception! So please make room for the newest addition to the Little BigPaw range… our Oven Baked British Roast Chicken Treats for Dogs. Baked in our Little Bakery’s wood fired carbon neutral oven, nestled in the British Countryside, our British Roast Chicken treats are bursting with meat, fruits, veggies, conditioners and healthy herbs. They are also 100% Natural, Grain Free and Hypoallergenic. See below for more details! 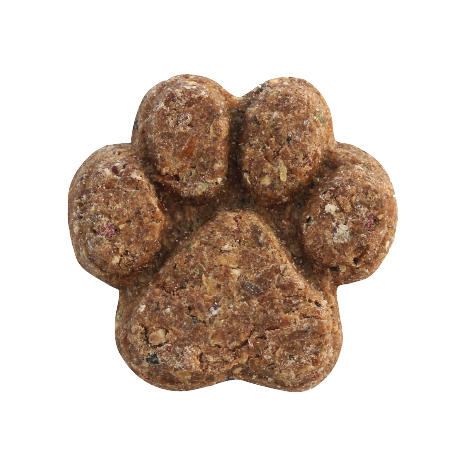 Every treat is shaped into our unique Little BigPaw “paw” shape, ideal to be broken into smaller pieces and used as a training treat or fed whole… either way we guarantee crunchy perfection in every bite. And what’s more the crunchy biscuit has great dental function and can aid tartar control as well as helping to clean your dog’s teeth after they have tucked into one of our delicious wet complete foods. Packed with protein – With 50% lean British Roast Chicken, an easily digestible protein source. Chicken promotes good health and improves dog’s immune systems. Superfood fruits – A juicy mixture of apple and blueberries, both a fantastic source of fibre and full of Vitamins A and C.
Natural Carbohydrates – Sweet Potatoes are low in fat but high in nutrients making them easily digestible. And Chickpeas – full of protein and fibre to aid digestive health. Healthy Herbs – Naturally nutritious herbs including yucca extract which is great for improving skin and coat condition. Natural Joint Supplements – Green lipped Mussel and MSM are both added to the recipe for their fantastic joint health benefits. Green Lipped Mussel is also packed full of Omega 3 which can aid skin and coat condition too. Always ensure fresh drinking water is available. My dogs go mad for these treats, love the quirky Paw shape! Very healthy with lots of meat too. Great for active dogs.